Neil Armstrong spotted it from the moon, but the Government, NASA and the CIA keeps it Top-Top secret Not even the president is given this information: The light bends around it, so it can not be seen from an orbital sattelite, gravity and magnetic field is also bend around it so navigating ships and airplains can not approach it. UNTIL NOW. Our own Mr Magoo discovered it that a ship built entirely from non magnetic, organic materials is not influenced by these forces and was able with his pickaroons to land on this island and plunder its enormas wealth. He found all the lost cities of the legends to be true, Cibola, Tartessos, Lemuria, they are all there. This is 12 X 12 map but only nine cities. It emphasizes track layout not unlike a model railroad would. Tunnels and steel bridges are very expensive (100X), so you should avoid them. There is plenty of room between cities, so with a little foresight you can have a neat layout. There is only enough building spot left to build the scenario-required industries. The lumber industry is strictly for filling empty building spots. There is no profit from them. You can make enough money from hauling mail. The cities produce passengers for industry needs, _oil,_mining _ but will not accept passengers, so do not try to haul passengers from one city to the other. It will not pay. I keep crashing every time I try to play it. 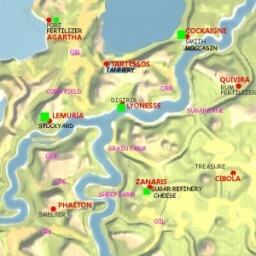 Is there any other maps that looks like this in terms of distance and prices of bridges and tunnels. It should not crash if installed properly. When does it crash? Installing or while playing? jancsika, egész véletlenül nem vagy magyar? 😀 Nekem is crashel, kéne support.